The Beacon School, an elite New York City public high school, rarely if ever holds silent tributes. It's never mourned the deaths of the estimated 500,000 Syrians killed by the government of President Bashar Assad and its allies. It's never mourned the murders of 2,000 Israelis in the last two decades. That's why so many parents and community members were shocked and outraged when a schoolwide silent tribute to Palestinians killed along the Gaza border with Israel was authorized. The school permitted a student to make a special announcement over the public address system, disrupting the entire student body, and causing children and teachers to stop what they were doing -- regardless of whether or not they had an interest or desire to participate in a tribute to violent rioters who were overwhelmingly Hamas terrorists with one goal: to storm Israel's borders and murder innocent Israeli Jews. No school should be promoting a moment of silence for mobs armed with Google maps to Jewish communities and using machine guns, Molotov cocktails, meat cleavers, improvised explosive devices, grenades, and "kite bombs" painted with swastikas to infiltrate and burn Israel's sovereign territory, and attack and murder Israeli civilians who live only minutes from the Gaza border. 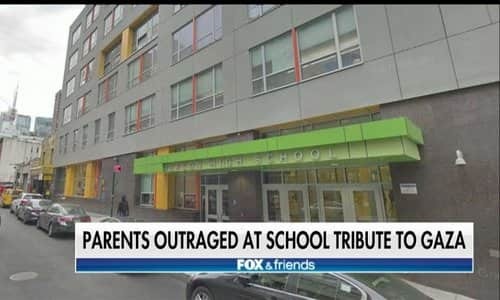 Yet rather than explain to the Beacon School community how and why this tribute was allowed, and listen to and address parents' understandable objections and concerns, school officials have shown little remorse and provided no explanations. Its principal Ruth Lacey recently held a meeting with parents, though it was not open to the community. Only a select number of parents were reportedly allowed to attend; no one seems to know how they were chosen. On June 1, Lacey finally issued a letter to Beacon families, but failed to acknowledge that school officials exercised abysmal judgment, misunderstood facts of Hamas's war against the Jewish state, and violated New York City school regulations in holding a schoolwide tribute to rioters and terrorists. Instead, Lacey simply offered her "regret" if the announced tribute "offended anyone in our school community," which was like "rubbing salt into an open wound" in the words of one parent. Backed by parents, the Zionist Organization of America sought answers from officials and also raised legal concerns. No response. In a letter to Superintendent Kathy Rehfield-Pelles, the ZOA not only questioned the Beacon School's disgraceful decision to authorize a tribute to, of all people, terrorists. We also raised Beacon's violation of a New York City school regulation issued by the chancellor that prohibits school facilities, equipment, and supplies from being used for partisan politics of any sort. In 2009, the New York City School Chancellor promulgated Regulation D-130, which makes it clear that school buildings are not public forums for purposes of community or political expression. New York City public school teachers challenged this regulation in court after they were barred from wearing political campaign buttons in schools, claiming that Regulation D-130 violated their free speech rights. A federal court in New York rejected their claim, determining that the regulation was a valid reflection of the Board of Education's legitimate "wish to maintain neutrality on controversial issues." The public tribute to Hamas terrorists at the Beacon School did not involve the speech of teachers. It was a student's speech, but the same principles apply. The Beacon student delivered her message on school property during the school day and over the school's public address system, subject to the control of school officials and with their approval. Other students were made a captive audience to a political message that, by all appearances, bore the school's seal of approval. Regulation D-130 prohibits that kind of political partisanship at the expense of students' right to learn in an environment free from partisan political influence. That doesn't mean that political and controversial topics are off-limits in New York City's public schools or that students are precluded from expressing their political views. Indeed, the New York City Department of Education issued a Bill of Student Rights and Responsibilities that sets forth a number of ways in which students can express their opinions and discuss issues. They include, for example, participating in student government and student organizations, publishing school newspapers, and posting bulletin-board notices. Yet even these activities are subject to regulation and restriction if they materially disrupt the school, cause substantial disorder, or invade the rights of others. There's nothing in the Bill of Rights that authorizes a student to use a school's public address system -- holding hostage the entire student body -- to protest and mourn the deaths of rioters and terrorists or to express any other point of view. The ZOA has urged the superintendent to institute an immediate and thorough investigation of what occurred at the Beacon School. If the investigation reveals a lack of professional judgment and/or a violation of school regulations, then we asked that the wrongdoers be held accountable. We sent copies of our letter to the Chancellor of the New York City Department of Education and to the Department's General Counsel, among others. So far, not a single official has responded. New York City's families have a right to expect more from school officials. They are entitled to leadership that is exercised responsibly and responsive to their concerns, particularly when students' emotional well-being is at stake. We understand that some students were upset by the public address announcement, and students who did not support the silent tribute have been ostracized by their schoolmates. That is unacceptable. The Beacon School owes students, parents, and the community an explanation, an admission of wrongdoing, a genuine apology, and a commitment to exercise sounder judgment going forward. The school should have abided by the chancellor's regulation and refused to allow its public educational mission to get entangled with partisan politics. Authorizing schoolwide tributes to violent rioters and terrorists who are storming a country's borders to murder innocent civilians is wrong and indefensible.